A must-attend event if you are interested on blockchain and/or energy. Come to hear and ask all the things you want to know about the open-source, cooperative tool that Pylon Network is developing for the energy sector. Since approximately four weeks ago, we had informed you about our meetup in TechHub Swansea, on Monday February 19th – read more about Swansea event here. 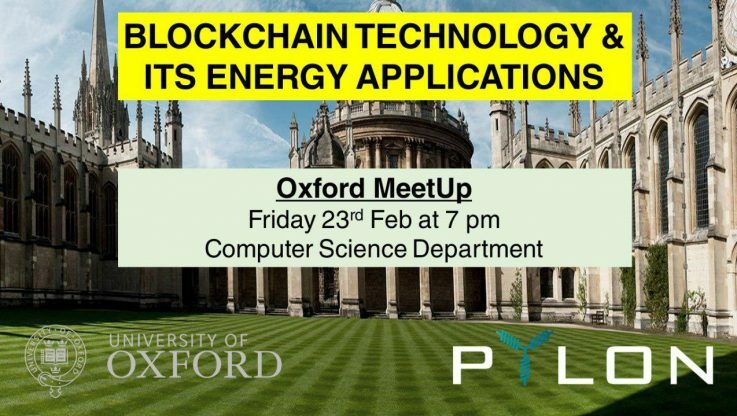 We have now confirmed the addition of Oxford as a meetup destination, on Friday, February 23rd, at 7pm. The meetup will take place in the Computer Science Department of the University of Oxford ( Lecture Theatre B, Wolfson Building, Parks Road, OX1 3QD) and participation will be free (registration needed). For registering, click on the following link and follow the instructions. The presentation will initially cover some aspects of the potential benefits from the synergy of blockchain and energy and then go through all aspects of Pylon Network and our recently released blockchain core code for Pylon Coin (the first open-source, blockchain code designed specifically for the needs of the energy sector). As always, the meetup will close with a Q&A session. Unfortunately, there will be no refreshments or snacks as part of the arrangement. In short, next week becomes the UK tour week for Pylon Network – so there are increasing chances of making it to one of the presentations of Pylon Network. Blocks, smart meters, and energy markets – how better can it get?